There is a lot of buzz around blockchain technology, distributed energy resources (“DERs”), microgrids, and other technological innovations in the energy industry. As these innovations develop, energy markets will undergo substantial changes to which consumer and industry participants alike will need to adapt and leverage. 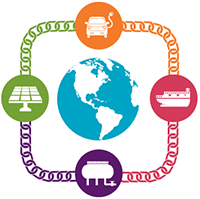 Every other week, K&L Gates’ The Energizer will highlight emerging issues or stories relating to the use of blockchain technology, DERs, and other innovations driving the energy industry forward. To subscribe to The Energizer, please click here. Ovo Invests in Electron’s Distributed Flexibility Marketplace; Saudi Aramco Launches Blockchain Pilot Program. Puerto Rico Energy Commission Looks to Microgrids to Promote Electric Grid Resilience. To view more information on these topics in Volume 41 of The Energizer, click here.